SportsArt ellipticals are not the most popular cardio machines simply because they are not very well known and they are only available at high-end exercise equipment retailers. However, if you have the budget, they are definitely worth considering as they are extremely well made and biomechanically designed. SportsArt has been around since 1977 and has positioned themselves as one of the largest exercise equipment manufacturers in the world, selling in more than 70 countries with offices in the US, Europe, the Middle East, the UK and Taiwan. They are known for their unique technologies, holding hundreds of patents, and their dedication to producing high-quality exercise equipment that is built to last. They are also focused on saving the environment, recently introducing their Eco-Powr line to help gym owners reduce their carbon footprint. In addition to elliptical machines, SportsArt manufactures treadmills, cycles, alternative trainers, strength and medical equipment. SportsArt ellipticals come in three different series, so you can choose the machine that appeals to you based on your budget. The most affordable series consists of the E835 and the E840, ranging in price from around $3300 to about $4500. Features include Myflex pedal cushioning, 40 resistance levels, Cardio Advisor, wireless heart rate monitoring and about 14 built in workouts. Moving up you have the E845, E845S and G845, ranging in price from $5000 to $5600. In addition to power adjustable strides up to 29" you also get stride and resistance controls on the handles. The S model gives you the option of a 15" touch screen while the G utilizes the aforementioned Eco-Powr technology to save energy. 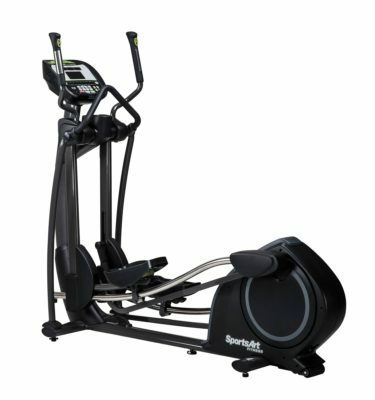 At the top of the line you have the SportsArt E875 and the G875 ellipticals. These will run you around $7000+. These offer VariStride technology in addition to everything found on the Performance Series. In addition to these 6 SportsArt ellipticals you also have the S775 Pinnacle Cross Trainer. Starting at around $7000, this is the only cardio machine that lets you not only go forwards and backwards, but also side to side, and you can adjust the width and length of your stride, change your foot position and vary your hand position as well. No matter which model you choose, you really can't go wrong. All of the ellipticals are well built and well designed, and give you plenty of workouts to choose from. Any negatives? Besides the high price that makes the SportsArt ellipticals out of reach for most of us, it would be nice to get touch screens on all models as well as some workout tracking capability like you find even on lower end models these days. Other than this, we have no complaints about SportsArt. They made solid exercise equipment. Which SportsArt Elliptical Should You Buy? Keep in mind that the SportsArt ellipticals are very high end cardio trainers, usually found in commercial settings. Unless you have a very high budget, you'll be perfectly suited with something like a Matrix elliptical, which is less expensive than the Foundation Series from SportsArt and gives you everything you could possibly want. Still, if you're set on a SportsArt, these machines are all great. Your best bet is to decide what your budget is, and choose a model that fits it. There is a big range between the base Foundation ellipticals and the top of the line Status Series. Personally, we like the Performance Series with their adjustable strides and EcoPowr option.